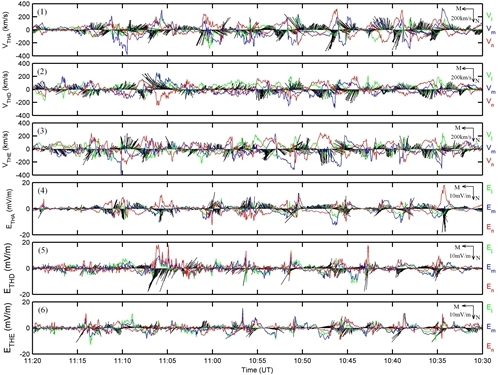 BY following up the in situ observations of NASA’s The Time History of Events and Macroscale Interactions during Substorms (THEMIS) at the duskside of the magnetopause, Dr. YAN Guangqing etc. at the State Key Laboratory of Space Weather, the National Space Science Center (NSSC), investigated the Kelvin-Helmholtz (K-H) vortices under southward Interplanetary Magnetic Field (IMF). The collaborative work of Dr. Yan etc. and Prof. Forrest S. Mozer, etc, from the Space Science Laboratory at the University of California, Berkeley, clearly showed that K-H vortices can also occur under southward IMF. The research results are unconventional and considered to be a breakthrough in a way that space physicists used to predict K-H vortices can only occur under northward IMF. The K-H vortex is the nonlinear stage of one surface wave sandwiched between two different regions with velocity shear. At the flanks side of the magnetopause, as the solar wind flows tailward and produces a shear with the stagnant magnetospheric plasma, it is amendable to excite the KHI and K-H waves. The nonlinear stage of the K-H surface wave could possibly cause the transport of solar wind into magnetosphere through the low-latitude boundary layer (LLBL). Conventionally, space physicists considered that the K-H waves were more preferentially excited during northward IMF, and more than enough evidence had testified the above conclusion. Up until now, only one event in which K-H waves were observed under southward IMF was reported by Hwang et al in 2011. During the interval from UT 10:30 to UT 11:20 on October 12, 2012, THEMIS observed several magnetopause crossings periodically at the duskside of magnetopause under southward IMF, with significant sunward returning flows inside the magnetopause. The TH-B at the lunar orbit (in the upstream solar wind with a ten-minute time lag) monitored the steady southward IMF. The vortex features of the flows and the periodic enhancements in the calculated vorticity normal to the spacecraft plane could be found in the observation, and the propagating features could be seen in the time lags from one spacecraft to another. The electric field observation at the magnetopause indicated that the distortion of the magnetopause was caused by the K-H vortices. Another important finding is the circular-induced electric field at the edges of the K-H vortices caused by the magnetic field compression, estimated to be about several mV/m according to Faraday’s Law, in consistency with the observations from spacecraft. This is the first observational report of such induced electric field at the edges of K-H vortices. The observational evidence could help to understand the K-H vortex and its role in the solar wind transport into magnetosphere. 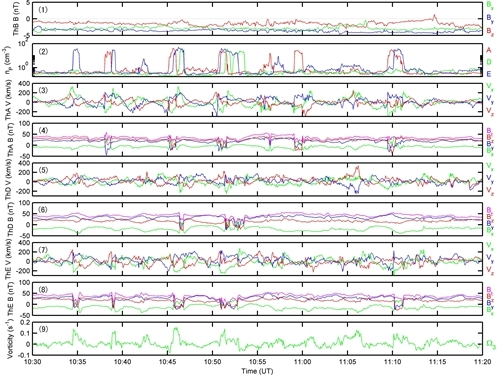 The research result entitled Kelvin-Helmholtz vortices observed by THEMIS at the duskside of the magnetopause under southward interplanetary magnetic ﬁeld was published on the Geophysical Research Letters (GRL), a biweekly peer-reviewed scientific journal of geoscience published by the American Geophysical Union (AGU). 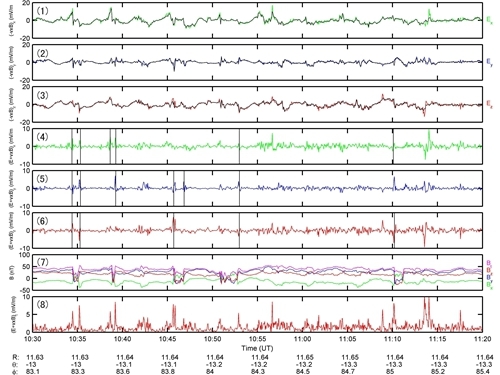 Citation: Yan, G. Q, F. S. Mozer, C. Shen, T. Chen, G. K. Parks, C. L. Cai, J. P. Mcfadden (2014), Kelvin-Helmholtz vortices observed by THEMIS at the duskside of magnetopause under southward IMF, Geophys. Res. Lett., 41, doi:10.1002/2014GL060589.